Do you make a point to brush your teeth twice a day? What about visiting a primary care doctor once a year? If your health is important to you, you are probably already taking preventative measures to maintain your health, and the same applies to your spinal health! Bird dog is great for strengthening the abdomen and back and it also helps with spinal stabilization. Bird Dog reinforces proper spinal alignment and engages your core. Start in table position on your hands and knees, with a neutral spine. Lift your left leg so that it is parallel to the ground. Keep strong and stable on your arms and other leg. Hold your hips steady and try not to shift your weight. To take the movement up a notch, lift your right arm straight out in front of you, also parallel to the floor. Hold that pose for about five seconds, then lower your leg and arm into table position. Switch sides. Repeat this movement 3-5 times. Cat/Cow is a traditional yoga warm-up that gently moves your spine and loosens your muscles and increases flexibility. It also improves circulation around the discs of your spine. Start again in table position (on your hands and knees). Be sure that your wrists are stacked under your shoulders and your knees under your hips. Your spine should be in a neutral position. Take a deep breath in and on the exhale engage your core, pulling your belly button toward your spine as you round your back into cat position. Tuck your hips and lower your head, like a Halloween cat. Next, on an inhale, reverse the movement and drop your belly towards the floor. Keep your core engaged as you push your chest through your arms into cow pose, lifting your gaze and rear end toward the sky. Repeat this movement back and forth on your breath, exhaling to cat and inhaling to cow 3-5 times, twice daily. Your hamstrings are the muscles that stretch from the back of your knees to your tailbone. If they are tight, it can cause lower back pain. When this happens, the muscles actually shorten which puts strain on your back. By keeping them loose and stretched, the muscles is lengthened, reducing stress and tension on your lower back. Start by lying down on your back and stretch your left leg out while placing a towel, strap, or belt around the arch of your right foot. Straighten your right leg and push your heel up toward the sky. Hold on to both sides of the strap and focus on straightening your right leg and making it perpendicular to the floor. Hold this stretch for 15-30 seconds before slowly lowering and repeating on your left leg. Do this for 2-4 repetitions. To strengthen your abdomen and back, you don’t just have to stick to traditional sit-ups. Try to avoid any unnecessary strain and give partial crunches a try. This move increases your core strength without causing back pain. Start by lying on your back with your knees bent and your feet flat on the floor. Stretch your arms straight up with your fingers reaching for the ceiling. Inhale, engage your core, and lift your shoulders off the ground. Hold this pose for one second, then slowly lower back down to starting position. On your next breath in, repeat. Do this for 8-12 repetitions. Be mindful of the placement of your feet, tailbone, and lower back and that they are touching the floor throughout the exercise. Supine twists are a great stretch for your back. These twists stretch your back muscles and glutes while also strengthening your core. These twists even realign your spine and hydrate your spinal discs. Lie on your back and look up at the ceiling or sky. Stretch your left leg long and bend your right knee. Place your left hand on the outside of your right knee, and drop your right hand down to your side. Take a deep breath. On the exhale, use your hand to draw your right knee across your body toward the left. Let your gaze fall to the right. Keep your right shoulder on the ground and hold the position for 5-10 seconds. Return back to center and repeat this move on the other side. Do 2-3 repetitions in the morning and evening. If you are looking to reduce and prevent lower back pain, these stretches can help. 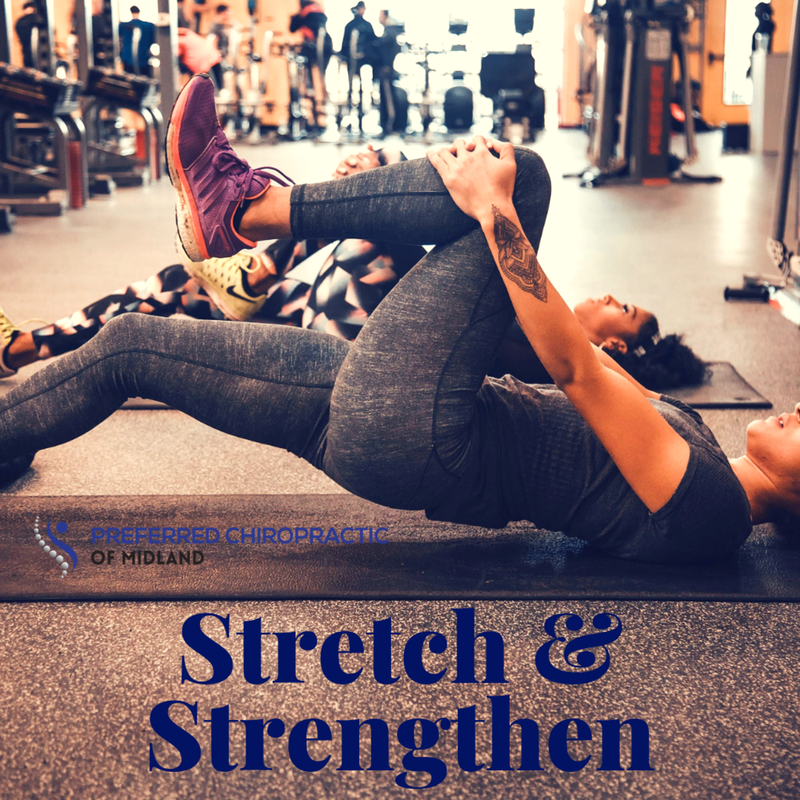 If you’re interested in more stretching suggestions, just ask during your next appointment or schedule a consultation today! Newer PostSlip and Fall? We're Here To Help! Older PostStay Away From Sugar!